If your DAW's built‑in EQ doesn't quite have the analogue flavour you're after, PSP's new plug‑in collection might be just the ticket. PSP never fail to come up with something a little bit special, so when I heard they'd launched a bundle comprising four different styles of equaliser plug‑in, I was intrigued. As with other PSP offerings, these support the VST and RTAS plug‑in formats for Windows, while the Mac versions are universal binaries that support Audio Units, RTAS and VST. Some aspects of these equalisers are 'inspired by' established and respected outboard analogue hardware, but their functionality has been extended beyond what the originals offered, for example by including variable high‑pass filters or switchable slopes for the shelving filters. Switchable saturation is available in the output of each plug‑in, and is designed to offer a smooth, overdriven sound when driven hard, instead of the usual clipping. This is located after the output level control and has its limit set just below 0dBFS, so once it's on, you can't clip the output. PSP tell us that parameter values such as gain, frequency and Q may differ from their displayed values to some degree, as they invariably do with 'real' analogue equalisers. All four plug‑ins automatically 'upsample' audio when the sample rate is below 50kHz, and they also employ 64‑bit double‑precision floating‑point arithmetic to minimise mathematical rounding errors, all of which improves resolution. However, PSP also claim their algorithms are very efficient regarding CPU overhead, so you don't have to feel guilty about using several while mixing. This means that even Mac G4 users can run them, though a G5 or Intel machine is preferable. 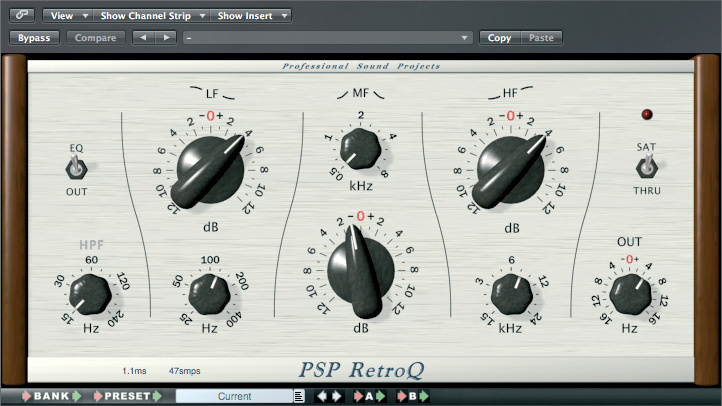 The four plug‑ins in the SQuad bundle are ClassicQ, ConsoleQ, preQursor and RetroQ. ClassicQ clearly strives for an early Neve vibe, combining musically smooth high and low filters with very controllable mid‑range adjustment. Each filter section has its own in/out button in addition to the master bypass. To complete the illusion, there's a switchable emulation of the distortion and filtering characteristics of class‑A circuitry and the audio transformers used in those old hardware boxes. Non‑original features have been added, specifically an adjustable high‑pass filter, switchable Q for the low‑shelf and high‑shelf filters, and a sweepable mid‑range filter. The low and high EQ sections include a switch to increase the Q, while the mid‑range has an auto Q option, as well as a 'x10' frequency button. As such, it's good for treating individual tracks prior to mixing, but it's more than just a straight attempt to clone the Neve hardware. Also chasing the 'British' vibe is ConsoleQ, which uses desk channel EQs such as those made by Amek as its role models. Again, though, PSP have added several non‑original features, such as an adjustable high‑pass filter with a control to adjust the steepness, and a choice of three Q settings for the two mid‑range filters. The mid‑range 'bell' or band‑pass filters are designed so that the Q factor of these filters gradually increases as more cut or boost is dialled in, making this a pretty surgical EQ that could be useful for fixing awkward sound sources when mixing. Both the LF and HF shelving controls have two switchable steepness settings. ConsoleQ has more of an assertive sound than ClassicQ, making it useful for treating difficult tracks within a mix to create better separation. It has a very intuitive control layout with bypass buttons for each EQ section. The oddly‑named PreQursor, meanwhile, looks something like an old Neve equaliser, but is actually an original PSP design based around four low‑Q filters, the idea being to reduce ringing while still maintaining good band separation. The emphasis here is on natural‑sounding EQ, both for track tweaking and mix adjustment. The frequencies are switchable and all four band‑pass filters have progressive Q factors that change depending on how much cut or boost is applied. The designers recommend it for processing acoustic instruments or full mixes, as it manages to massage the frequency spectrum without detriment to the natural sound of the audio being processed. RetroQ is another plug‑in based on PSP's own vision of what makes a good equaliser. One of the key factors they identified as being important to a natural sound was low phase distortion, and RetroQ is designed to sound musically natural rather than obviously EQ'ed. Its shelving filters are taken from the well‑known PSP Vintage Warmer and teamed with the swept mid‑control of the RetroQ. There's also a variable high‑pass filter, but no individual band bypass buttons this time. PSP recommend the plug‑in for musically gentle mix sweetening which, after using it, seems pretty much spot‑on. PSP have always managed to come up with sweet‑sounding equalisers, and this collection is no exception. They all respond very much like analogue hardware would, with ConsoleQ and ClassicQ having the most noticeable characters — they don't just change the tonal balance, but also influence the overall sound in a subtle but musical way, even if you don't push them into saturation. Even a relatively small adjustment can make a large subjective difference to the sound, something I attribute to the way the phase relationships between the harmonics are changed by the equaliser. These are definitely the EQs to use if a track needs to be pulled out of a mix or, conversely, pushed further into the background. They also work well for restricting the spectrum of a sound to make it sit more comfortably in a mix. While ClassicQ offers simplicity, ConsoleQ has the benefit of dual mid‑range controls and a very logical layout that remains uncluttered, thanks to the use of dual‑concentric knobs. By contrast, preQursor and RetroQ perform their magic with greater transparency, so that you hear the effect of the EQ but not the sound of the equaliser doing the work. Again, this may be down to the amounts of phase shift being smaller in these designs. It's difficult to nail down the exact tonal differences between these two equalisers, as the results depend on the source material, but they both do a good job of addressing tonal balance issues without strangling the sound, and I really like the straightforward feel of preQursor. When used more aggressively, the differences become more apparent, as preQursor has four 'bell' sections, whereas RetroQ uses more conventional shelving EQs at the extremes. To my ears, the saturation emulation usually works best if used very sparingly, though you can get good results on sources like snare drums by deliberately hitting the levels hard. I found that the best way to set this up was to adjust the level control with the saturation switched off, so that the DAW meters showed clipping of maybe two or three dB. The red light on the plug‑in flashes when clipping occurs, but once 'Sat' is switched on, the level is pinned at just below 0dB, so there's no flashing light to help you gauge how much saturation you're getting. I'd have preferred the light to work in Sat mode to indicate when the level was high enough to cause saturation to take place, but this is only a minor irritation. Most DAWs already come with one or more equaliser plug‑ins, but PSP equalisers do manage to capture that elusive warm and cuddly analogue vibe, and that's what you're paying for here. The four equalisers in the bundle cover just about every eventuality, and if you're not sure which one to use, just try them all and use your ears. If you're looking for good analogue EQ emulations, there are some nice‑sounding variants from the likes of Sonnox and Waves, while if you want to invest in a DSP unit, Focusrite's Liquid Mix and the Universal Audio UAD equalisers are excellent. The four equalisers cover most requirements. No visual indication of how much saturation is taking place once 'Sat' is engaged. This is a very useful and comprehensive package of equalisers, which offers features and tonality over and above what you'd expect to find in most bundled DAW plug‑in collections. Apple Mac Pro with 2x 2.8GHz Quad‑core Intel Xeon CPUs and 10GB RAM, running Mac OS 10.5.6.